“It’s important to create a nice background that looks like a minimalist boutique for Pat’s OOTDs (outfit of the day),” jokes Tay. Chiquit Brammall added this to How Do I... Design an Efficient Walk-In Wardrobe? Wardrobe inventory Keeping stock of your wardrobe contents will determine how big a closet space to go for. “A personal inventory list detailing the items of clothing you need to store can help estimate the dimensions for different groups of clothing items,” explains Yong. “Based on the different groups of clothing outlined in the list, you need to ask yourself if you can maintain the good habit of putting clothing or accessories back to the planned segments in the wardrobe after use or a wash.” “If it is a challenge to put things back where they belong, it may be prudent to include wardrobe accessories to simplify the organisation process”, he adds. 1. 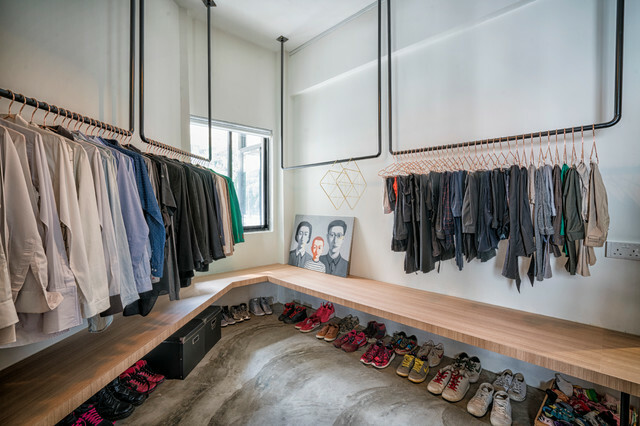 Location: SingaporeDesigner: OblliqueFeatures: Making the most of an awkward angle, this walk-in wardrobe offers bench seating, hanging space and lots of room for shoes.